Alpha’s NACE-certified engineering professionals can conduct installation testing before constructing your cathodic protection systems. Our team will observe soil sensitivity, design standards and material selections, and other factors that could lead to corrosion. By confirming these potential corrosion hazards up front, our engineering professionals can provide remediation for these corrosion issues in the best cost effective solution. At Alpha we provide entire cathodic protection solutions to complex corrosion challenges in the western hemisphere, NACE certified corrosion engineering professionals, top notch cathodic protection materials & cathodic protection systems, full installation of cathodic protection & A/C mitigation units, and project management oversight. Our specialized problem-solving approach package gives our customers the best cost effective solution to preserve units, reduce liability and maintenance costs, and ensure compliance with government regulations. Alpha Pipeline Integrity Services will also help the need for leak detection on newly installed buried pipelines and process equipment with our tracer gas through hydro testing. It is mandatory to have newly installed lines and equipment to be tested for the strength to ensure of any known anomalies, blow-outs, leaks, etc. before it is commissioned in service. 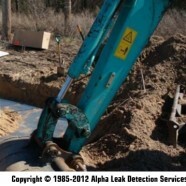 Click here to see why Alpha has the most cost effective solution when trying to find pin-hole leaks within pipelines and equipment.